Discover some of England’s most popular attractions in one day on this 12-hour trip to Stonehenge, Bath, the Cotswolds and Stratford-upon-Avon from London. Travel by air-conditioned coach to see the prehistoric stones at Stonehenge and glorious Georgian spa city of Bath. Then, drive through the enchanting hills and villages of the Cotswolds, and visit Stratford-upon-Avon, William Shakespeare’s birthplace. Enjoy Champagne and scones in the garden of his childhood home, and admire this half-timbered market town. Please note: As of April 1, Shakespeare's birthplace will be replaced with a visit to Shakespeare's Schoolroom, including a private reception with Champagne and scones. Perfect for time-pressed travelers, this tour includes shorter stops and pre-booked entry so you can see more. Depart your central London meeting point by air-conditioned coach, and journey out into the leafy English countryside. Make your first stop at UNESCO World Heritage-listed Stonehenge, one of the world’s best-known prehistoric monuments. Rising up from Salisbury Plain, this remarkable stone circle dates back some 4,500 years and is generally thought to have been a temple that marked the movements of the sun. On arrival, head inside the site complex with its visitor center, collect an audio-guide, and visit the massive stone circle to experience its size and symmetry close up. Ponder the mysteries that surround the edifice, and learn the theories as to how the stones were transported and then raised here. 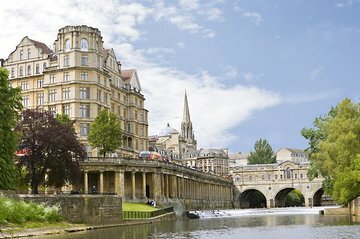 Next, continue to the delightful, UNESCO-protected spa city of Bath, famous for its elegant Georgian 18th-century architecture and connections with 18th- and 19th-century novelist Jane Austen. Explore the city center with your guide to admire the honey-stoned mansions, terraces and bridges, and enjoy a little free time to stroll around the cobbled streets at leisure. Back aboard your coach, travel deep into the Cotswolds, a region of rolling hills, green pastures and stone-built villages that’s considered perhaps the loveliest in England. Soak up the gorgeous views of the lush fields honeycombed with dry stone walls, and pass through bustling market towns crowned by impressive churches. Arrive in the charm-laden town of Stratford-upon-Avon, the birthplace of England’s greatest playwright, William Shakespeare, and home to the famous Royal Shakespeare Company. Take in the half-timbered houses and Avon River that winds through the town. Then, enjoy glass of Champagne and traditional English scones in the garden of Shakespeare's childhood home (or indoors in winter), and stretch your legs around Stratford’s quaint center. Please note: As of April 1, Shakespeare's birthplace will be replaced with a visit to Shakespeare's Schoolroom, including Champagne and scones, a tour, and a school lesson as it was back in Shakespeare's time. When your visit to Stratford ends, return to your coach and drive back to London where your tour concludes. Please note: on busy days, the order of the activities as shown above may be subject to change. Amazing !!! Highly recommend ! Beautiful scenery , saw so much ! Jason was great! We had the perfect day ! Tour was great and fantastic seeing so much in such a short space of time. Bus and WiFi had a lot to desire. Tour guide had no personal touch. Very localized experience. Guide was good, setting the mood right before we enter Shakespeare's birthplace by reading us some of his pieces. The school hall was a good experience. Good trip, relaxing, enjoyable tour, informative. Guide is very knowledgeable and friendly. Recommend the tour to others. Fantastic trip! Well worth the money. Bus left at 8:00 on time and back in London at approx 20:30Magnus guided well and made the trip even more interesting and fun. Overall a fantastic day out of London and great fun. We had an excellent tour guide who shared lots of information on the history of all the areas visited. We highly recommend this tour! We could not have had a better guide or driver!! 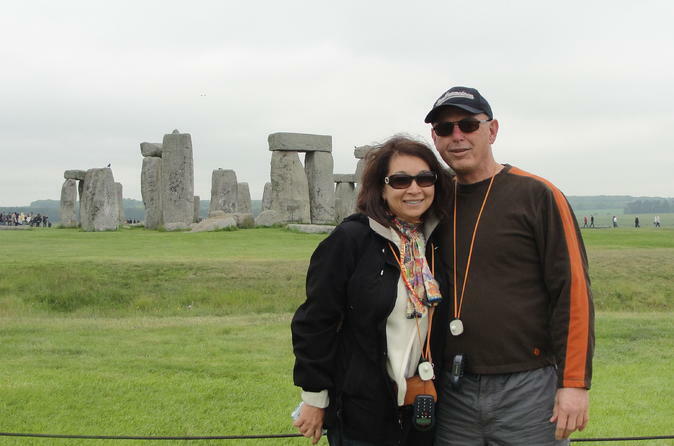 The tour went to Stonehenge, Bath, Stratford upon Avon, and through the Cotswolds. The guide was very knowledgeable, and there was plenty of free time at each stop. Highly recommend! I will recommend first-timers to just choose Stonehenge and Bath. Cotswolds will just a drive pass-by. There was no stop overs due to time constraint. Stonehenge was 1 hour stop. Bath was 2 hours stop. Going through the Bath museum was about 30-45mins excluding Lunch. Cotswolds was a drive-past. Stratford upon Avon was 1 hour with 30mins of experience at Shakespeare's school. It is worth spending a full day covering 3 key major sites. I enjoyed very much in comfortable bus hearing a tour guide explanation. I rate it the best. Felt very rushed. The tour guide seemed annoyed with his job. Beautiful sights.